The Germ Tube Test, also known as Reynold’s Brande phenomena is a screening procedure which is used for the identification and differentiation of Candida albicans from other yeasts. This test allows the detection of the Germ Tubes which are the initial stage of hyphae formation. These are the short, non-septate germinating hyphae which are one half the width and three to four times the legnrh of the yeast from which they originate. 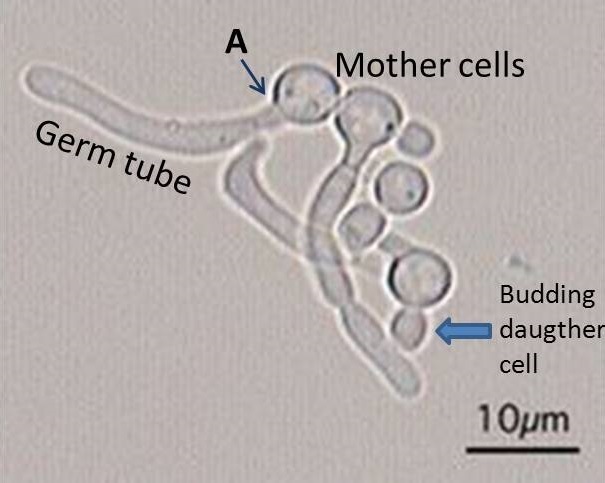 Approximately 95-97% of Candida albicans isolate develop germ tube when incubated in a proteinaceous media at 35C for 2.5-3 hours. Examine the wet mount microscopically using low power objective. Use high power objective to confirm the presence or absence of germ tubes. a pinch of dextrose needs to be added….which enhances the growth…..and observation should be done evry half an hour. other methods of detection of germ tube? what will happen if incubated moe than two hr? why plasma is not used?